When hearing the word “salad,” a heaping bowl (or mason jar…) of leafy greens most likely comes to mind. While lettuce-based salads are delicious vehicles for vegetables and other nutritious toppings, salads come in many other forms. This summer, step out of your leafy comfort zone, and discover a whole new world of lettuce-less salads in which other exciting, nutrient-dense, and in-season fruits and vegetables receive the attention they rightfully deserve. Try these 5 colorful and crunchy lettuce-less salads that can be prepared and dressed ahead of time—because no lettuce also means no wilting! 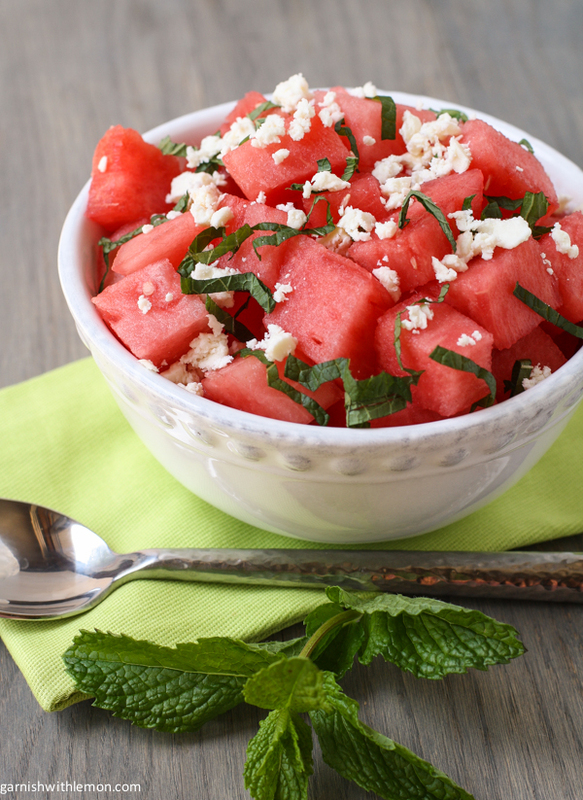 Sweet watermelon and salty feta cheese are a winning combination. The perfect summer fruit, watermelon is comprised of approximately 90% water and is a rich source of vitamin C and beta-carotene. Adding heart-healthy almonds to the recipe also provides a nice crunch. To heat things up, try lightly grilling the melon to bring out its unique flavor. Whether served hot or cold, this simple salad makes a tasty appetizer or light main course. Mix 3 cups cubed watermelon, 1/4 cup slivered almonds, and a sprinkle of fresh mint. Dress with balsamic vinegar and a dash of olive oil. Top with 1/4 cup feta cheese. This nutrient-packed salad (that’s actually a slaw) makes an appetizing side dish for any start-of-summer barbecue. By using broccoli as the base, this salad’s nutrient content is immediately elevated. The cruciferous vegetable is loaded with fiber, folate, vitamin C, calcium, lutein, and zeaxanthin. Although lutein and zeaxanthin should be a part of your diet all year round, summer is a terrific reminder to load up on foods high in these antioxidants because they may protect your eyes from the harmful sunrays. Combine 1, 12-16 ounce package of shredded broccoli slaw, 1 cup shredded carrots, 1/4 cup finely diced red onion, 1/4 cup Craisins, and 1/4 cup slivered almonds. Top with dressing made from whisking together 1/4 cup nonfat plain yogurt, 1/4 cup reduced-fat mayonnaise, 3 tablespoons cider vinegar, 2 teaspoons sugar, and salt and pepper to taste. Chickpeas, artichokes, and tomatoes join forces to create this tasty salad that packs a nutritional punch. While chickpeas provide the protein, artichoke hearts offer a bounty of flavor along with a hefty dose of fiber, folate, vitamin C, and vitamin K. If you choose to use canned artichokes for this recipe, be sure to wash them off before cooking because they are often high in sodium. Add 1, 15-ounce can of chickpeas, drained and washed, to a heated pan with a small amount of oil, and cook until chickpeas are brown. Set aside cooked chickpeas. Sautee 1 small clove of garlic and add 5 artichoke hearts, sliced (frozen or canned) to the heated pan, and cook until artichokes are brown. Mix chickpeas and artichokes with 1/2 cup grape tomatoes and season with salt, pepper, and lemon juice. Top with chopped parsley and a generous sprinkle of Parmesan cheese. This nutrient-dense salad makes a satisfying lunch or dinner. Quinoa is a complete protein, meaning it contains all 9 essential amino acids, and the avocado is jam-packed with healthy monounsaturated fats, dietary fiber, and potassium. Fun fact: 1 cup of avocado actually contains ~40% more potassium than 1 cup of banana! Combine 3 cups cooked quinoa, 1 1/2 cup shelled and cooked edamame, 1 cucumber peeled and chopped, 2 ripe cubed avocados, 2 chopped scallion, and 3 tablespoon chopped cilantro or basil. Top with dressing made of 4 tablespoons rice wine vinegar, 1 1/2 tablespoon low sodium soy sauce, 1 tablespoon sesame oil, 1 tablespoon lime juice, 1/8 tablespoon grated ginger, and salt and pepper to taste. This dairy-free salad is easy to make, inexpensive, and surprisingly delicious. Best of all, it goes with virtually anything. Try topping it with grilled chicken, fish, beans, hempseeds, sunflower seeds, jalapeños or any in-season vegetable…the skies the limit. 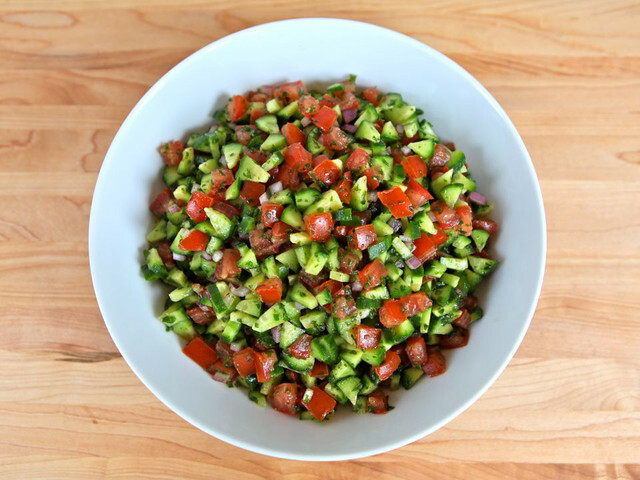 Mix 3 coarsely chopped plum tomatoes, 1 peeled and chopped cucumber, and 1 chopped bell pepper. Top with chopped parsley or mint, lemon juice, balsamic vinegar and olive oil. Becky Jay is graduating from the Nutrition Communication and DPD program this May. She likes her salads chopped–with or without lettuce.